Hawaii Signs Legislation To Implement Goals Of Paris Climate Accord Anyway : The Two-Way Gov. David Ige signed the Senate bill on Tuesday, saying he was motivated by the evidence of climate change visible in Hawaii. It's a commitment to reducing the state's greenhouse gas emissions. Hawaii Gov. 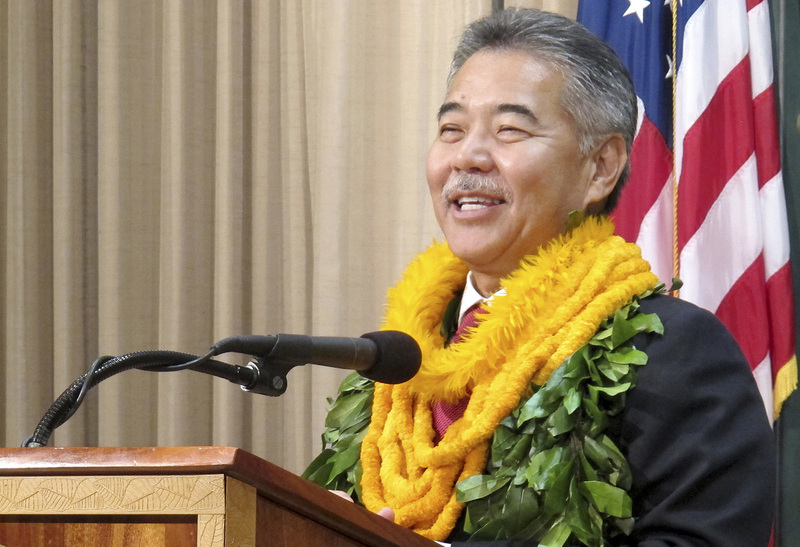 David Ige, shown here in 2014, has signed a bill to implement goals of the Paris Agreement in his state. Hawaii's governor has signed a bill that adopts goals of the Paris climate agreement, despite President Trump's announcement last week that the U.S. is pulling out of the global accord. "Reducing greenhouse emissions in Hawaii is now the law — the state law," reports Hawaii Public Radio's Bill Dorman. "While the specifics are a bit vague, the political message is clear: to keep pace with environmental commitments made as part of the Paris accord." Gov. David Ige signed the Senate bill on Tuesday, saying he was motivated by the evidence of climate change visible every day in Hawaii. "We are the testing grounds. ... We are especially aware of the limits of our natural environment," Ige said before signing the document. "Tides are getting higher, biodiversity is shrinking, coral is bleaching, coastlines are eroding, weather is becoming more extreme. We must acknowledge these realities at home. That is why Hawaii is united in its political leadership on tackling climate change." The law commits the state to reducing greenhouse gas emissions in order to align with the principles and goals of the Paris Agreement. State Sen. J. Kalani English, who introduced the bill, said the measure "gives us legal basis to continue adaptation and mitigation strategies for Hawai'i, despite the Federal government's withdrawal from the treaty." It also creates a commission to establish strategies to combat climate change and develop plans to manage the impact of rising sea levels. Ige signed a separate bill Tuesday establishing a Carbon Farming Task Force, aimed at identifying "agricultural and aquacultural practices to improve soil health and promote carbon sequestration." While the state says it is the first to pass legislation in support of Paris after Trump's withdrawal announcement, other governors have pledged to uphold the agreement inside their states. Hawaii is joining at least 12 other states that have formed the U.S. Climate Alliance and promised to remain committed to the goals in the Paris deal. In 2015, 195 countries agreed in Paris to set individual targets for reducing greenhouse gas emissions, with the shared goal of limiting the rise in average global temperatures to less than 2 degrees Celsius. While announcing his controversial decision, Trump said he was motivated by a campaign pledge to put American workers first. As The Two-Way reported, he stated that the agreement gives other countries "an economic edge over the United States." Only two countries are not part of the global agreement — Syria and Nicaragua. Trump's announcement also prompted more than 1,200 business leaders, mayors and college presidents to stress that they planned to continue working towards the goals set in Paris. The state of Hawaii is also challenging Trump's travel ban in federal court, saying it violates the Constitution and discriminates against travelers on the basis of religion.